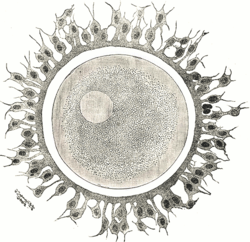 The egg cell, or ovum, is the female reproductive cell (gamete) in oogamous organisms. The egg cell is teepically nae capable o active muivement, an it is muckle lairger (veesible tae the nakit ee) nor the motile sperm cells. Whan egg an sperm fuse, a diploid cell (the zygote) is formed, that rapidly growes intae a new organism. This page wis last eeditit on 1 Juin 2018, at 21:08.